I said, (because you know me your blogger—neither silent nor retiring) that Gov grew up nearby skiing and his sister Jo coached the Roxbury ski team (a ski team which btw had the no 1 seed in the division in Nick Vajtay) and that Jo’s father-in-law Gary Hinkley started the mountain and that he still skied here everyday. That it is that kind of place where daughter-in-law of first owner coaches son of current owner, who is a fantastic racer. 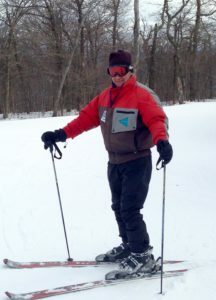 And Jo’s husband Allen Hinkley is also on the ski patrol here. Gary and Allen Hinkley on the hill together. And this the thing I was trying to say, trying to convey, that Platty is great because of those things, the family part…. Yes, it has ripping great terrain and steeps that are rare around here, but this other part sets Plattekill apart. I asked the guy how the snow had been in Jackson when he was there in January and he said icy. I nodded. I didn’t talk about how our season has been with snow and then rain in a heartbreaking cycle, but that hasn’t stopped people skiing. 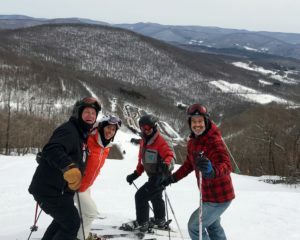 That day was bluebird with hard snow and – still – people had huge smiles. I told man-in-black that if he hurried, Gary Hinkley was still there. Really this is a sidelong way to get to Gary and his story. There are many things that fill me with pride at Platty like walking in with John in the morning at 8 am, and how he knows everyone’s name and shakes their hands and says hello. 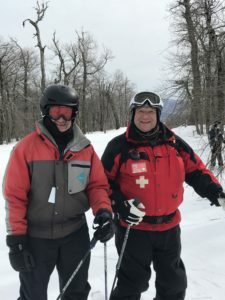 The warmth is not just from those skiing regulars but everyone—those who work there parking cars, or say Sam on the double chair chomping at the bit to get out and ski and talking about how your every run is. It’s that kind of place (and that John has been skiing here for 40 years. His father heard about it when John was little and then came up and kept coming. Now he has a house that he will pass down to his kids so they will come up, and he still remembers his first day here when he was, maybe, 13). But Gary, let me stay on point. That morning that Saturday of President’s Week in the lodge he was booting up before 8:15. The man is an octogenarian and still skiing every day the mountain is open. He always wears the same sweater I love that looks like it comes from about 1989 and the same jacket (similar era) geometric stripes and chevrons. And, then he has these great skis, which are not vintage but the best skis you can be on: Kästle. To see him doing run after run after run on every slope every day in every condition is inspiring. Like many friendships at Platty we met on the chair. He speaks with his words chewed down as if they were the Catskill Mountains themselves and he talked about the rope tow, the first one that only went a quarter of the way up. And, he still works construction not because he has to but to keep his hands in. Gary is the heart and soul of keeping it real.